Up to 85% of avoidable health costs and most disability are due to health behaviors. Fortunately there are some brief, best practice approaches for engaging at-risk individuals and facilitating better health. Compared to traditional patient education or popular health coaching approaches, validated approaches consistently deliver better patient-level outcomes in real-world health care settings. In health coaching, like any health care field, best practices are defined when trained and credentialed specialists review the clinical research and define effective interventions. Practitioners are then trained in these approaches and practitioner knowledge, proficiency and adherence to best practices is measured. 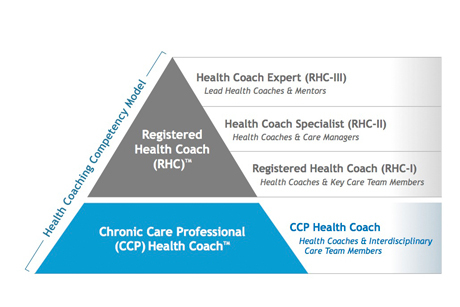 This was the process used to develop and validate the Registered Health Coach (RHC)® program. While Registered Health Coaches come from various clinical or nonclinical fields and settings, they share knowledge and proficiency in brief, highly effective approaches for engaging people at risk of, or affected by chronic conditions--and facilitating disease self-care, treatment adherence and lifestyle management. In fact, HealthSciences Institute faculty have demonstrated that health coaches who have been prepared and tested proficient in validated health coaching approaches can deliver four-fold improvements in engagement vs. practictioners who are less proficient in multinational employer settings. The Registered Health Coach Program recognizes excellence and provides a pathway for building health coaching knowledge and proficiency. Registered Health Coaches are included in a PartnersinImprovement® national online Health Coach Registry®. The registry is searchable by consumers, employers and purchasers. Organizations who require Registered Health Coaches are also recognized for quality. MI is the only health coaching approach that consistently delivers better patient-level outcomes in over 300 clinical trials. RHC training requirements are based on the validated training recommendations of the Motivational Interviewing Network of Trainers (MINT) and proficiency is measured with an externally validated tool for assessing MI health coaching proficiency. In February 2012, Dr. Susan Butterworth, a lead contributer to the development of the HCPA and RHC program, hosted a webinar session overviewing the program. Please view now: Becoming a Registered Health Coach (RHC): Your Pathway to Proficiency & National Recognition. If you have further questions please submit a technical support form.